A miniature replica of the actual Sayre Train Station sign that hangs in the museum. 6"x 19"x 3/4" solid wood hand crafted by a local enthusiast. Other towns available Athens, Milan, Ulster, Towanda. Will take requests. Sign length varies by name length. Price $25.00 + tax. Total $26.50 plus $5.00 shipping and handling. 11 historic to present day points of interest located in Sayre, are woven into this beautiful 50" by 70" afghan, fringed on four sides. Stock#0546 Price-$55.00 incl tax plus $7.00 shipping and handling. 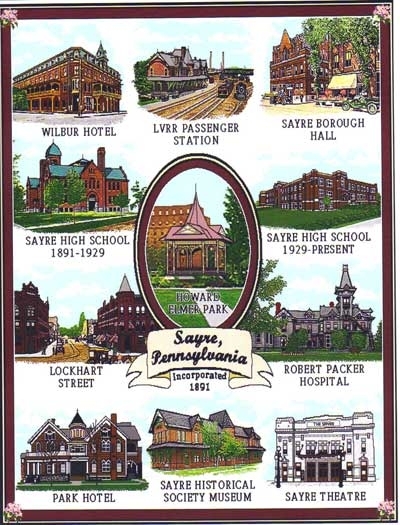 These antique post cards were produced for Boyle's Books in Sayre.